Do you use RxKotlin? Leave a review! We welcome contributions and discussion for new features. It is recommended to file an issue first to prevent unnecessary efforts, but feel free to put in pull requests. The vision is to keep this library lightweight, with a tight and focused scope applicable to all platforms (including Android, server, and desktop). Anything specific to a particular domain (for example, JavaFX or JDBC), might be better suited as a separate project. Feel free to open discussion and we will help figure out where your functionality may belong. over 2 years RxJava 2.0 Planning? almost 3 years DSL for Multiple Lambda Operators? about 3 years Do these methods really belong in RxKotlin? Add subscribeWith method for Single. Compile RxKotlin and examples with Kobalt. Add completable method for Completable. 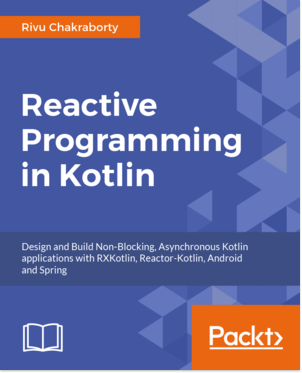 Use RxAndroid or RxKotlin when programming in Kotlin for Android? This is a breaking release removing some annoyances, specifically the toSingle() and toMaybe() extension functions targeting futures, callables, and even single T items. These caused far more harm than good, as they often clashed with other libraries and people's own extensions. For instance, RxKotlinFX has a Dialog<T>.toMaybe() extension which emits a dialog's response. This clashed directly with the toMaybe() in RxKotlin. Rather than deprecating these extensions, they were just removed to prevent further hindrance. Deprecated Observable#combineLatest() and its Flowable counterpart have been removed as well, and you can use the Observables and Flowables factories instead. RxJava and Kotlin dependencies have been updated as well. There are a number of changes in this release, some of which are possibly breaking. Many additions seek to expand the SAM helpers used to workaround the SAM issue. zip(), combineLatest(), zipWith(), and withLatestFrom() now support emitting Pairs and Triples when no combining function is provided for 2-3 source arguments. This applies to Observable, Flowable, Single, and Maybe types. toMap() and toMultimap() extension operators have been added to Observable<Pair<X,Y>> and Flowable<Pair<X,Y>>, which will automatically use each Pair emission to map the key and value without any arguments. Order of parameters for subscribeBy() have been moved so that onNext is the default if only one unnamed parameter is provided. Please file any issues if you have any questions or concerns. Thanks to everyone who contributed to this release. This is a quick release to remove Java 8 configuration, so this works on Java 6+. Also a blockingSubscribeBy() has been added as discussed here. Keep up with changes to RxKotlin! Would you tell us more about RxKotlin?